The Micro-SMG in Grand Theft Auto: Vice City. 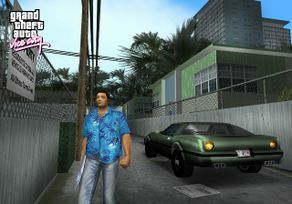 Tommy Vercetti wielding a Micro-SMG in a pre-release screenshot of Grand Theft Auto: Vice City. "Extremely popular on the streets." For the weapon with the same name from GTA San Andreas and GTA IV, see Micro Uzi. The Micro SMG is a powerful sub-machine gun with its full size featured in Grand Theft Auto: Vice City, Grand Theft Auto: Liberty City Stories, Grand Theft Auto: Vice City Stories, Grand Theft Auto: Chinatown Wars, The Ballad of Gay Tony and Grand Theft Auto V.
In GTA Liberty City Stories and Vice City Stories, the gun is called Micro SMG in-game, in GTA: Vice City, Uzi 9mm on the original PlayStation 2 version and Uz-I on all other versions. Every rendition of the Micro SMG holds 30 rounds per magazine. In Grand Theft Auto: San Andreas and Grand Theft Auto IV, the Micro SMG is actually a civilian-legal pistol version of the IWI Micro-Uzi sub-machine gun but called Micro SMG in-game. It can be identified as the pistol version because the side-folding wire stock is deleted, and there is no provision on the rear of the receiver to mount one. One can only assume that the pistol was illegally modified for full-automatic operation. The Micro-SMG has a respectable rate of fire, about 950 RPM, however it is slower than its real-life counterpart, which has an astounding cyclic rate of 1,250 rounds per minute. In Vice City, the Vercetti Gang carry Micro SMGs after the main storyline's final mission Keep Your Friends Close... is completed. The Micro SMG is also the starting weapon for the players after the regular pistol when advancing from the first points of the games. The version in Chinatown Wars appears to be an Ingram MAC-11 by the HUD Image. Members of the Los Santos Vagos in Grand Theft Auto V, one armed with a Micro SMG. In The Ballad of Gay Tony episodic title for Grand Theft Auto IV, the Gold SMG is essentially a gold plated Micro SMG owned by Yusuf Amir, and an improved version of the Micro Uzi. The full sized Micro SMG (alternatively called Uzi) was originally intended to be featured in Grand Theft Auto: San Andreas. Beta screenshots of the game show the Grove Street Families gang members perform a drive-by with the beta appearance of Big Smoke, Sweet and possibly Ryder or Big Bear. The gun was left out for unknown reasons although the animation for it from GTA Vice City was used for the MP5, when fired. The final version of the game features a Micro Uzi named Micro SMG in-game. Prawn Island - On the front porch of the Mendez Mansion. North Point Mall, Vice Point - Available to buy from Ammu-Nation from the start of the game ($400). Washington Beach - Near the front end of the tall apartment building with a swimming pool out back. Ocean Beach - Behind the Ocean Beach Pay 'n' Spray in a fenced area, reachable on foot. Downtown - Under the stairs that lead to the rooftop with the Skumole Shack, just northeast of The Greasy Chopper. SWAT officers - Killing one will cause them to drop the weapon. Vercetti Gang members - Wasting a group of them will give a decent amount of ammo. Only if the final mission is completed. Vice Squad - Killing them will make them drop their weapons. Chinatown, Portland - By a diner under the Callahan Bridge and the El-Train tracks. Cedar Grove, Shoreside Vale - Underneath the bridge leading to Pike Creek. Colombian Cartel members carry this weapon. Downtown - On roof of a small building accessible by stairs, northward of The Mendez Building. Under the stairs is a rampage available. Downtown - Available at the Ammu-Nation store from the start of the game for $600, but discounted to $450 after completing Phil's Shooting Range. Vice Point - Next to a jetty where a Violator spawns. The Micro SMG is located just across the Leaf Links Golf Club and a rampage location. SWAT Team Officers - Killing them from either a VCPD Enforcer or a VCPD Maverick causes the weapon to spawn. Vice Squad - Wasting them will give you Micro-SMG ammo. The Micro-SMG as seen in a beta screenshot of GTA San Andreas. Chan Jaoming wielding a Micro-SMG in GTA Chinatown Wars. The IMI Uzi in real life. In the iOS and Android versions of GTA Vice City, the Uz-I erroneously used a blue-and-pink version of the Micro Uzi's GTA III weapon icon. The Uz-I has since received its own weapon icon at an unknown date, while the Mac now uses the Micro Uzi's weapon icon. This page was last modified on 28 November 2014, at 23:29.